Please remember to keep the small parts out of the reach of children as they can be a choking hazard. Collectible Hangers may have sharp edges and sh ould always be mounted and changed with adult supervision. To show how Collectible Hangers work, we will use packaged die-cast vehicle examples. Collectible Hangers allows you to use various size and shapes of packaged vehicles on the same hanging display. You can also hang packaged die-cast vehicles that have been placed in protective plastic ‘eggshell’ containers. Again, on the same display. Most other die-cast vehicle displays only allow for one unique type of packaging to be placed in the display for mounting and/or hanging on the wall. Collectible Hangers has the flexibility to allow your imagination to decide how and what you would like to display together. There are endless possible layout designs. Don’t forget to check out www.collectiblehangers.com for more information including; How to Videos, FAQs – Frequently Asked Questions, Gallery of Collectible Hanger Displays, Purchase Replacement Parts and Accessories. Please read carefully and follow instructions to reduce the likelihood of serious injury. An adult should mount the U-Rail. Children should be supervised at all times when near or touching the U-Rail. Never use the U-Rail as a toy. Use caution as corners of the U-Rail can be sharp. This is typically the case for this type of material when used for strength and stability. It is strictly for mounting on a surface to hold the D-Track with T-Plugs. Only mount U-Rail with provided U-M Clamps. Unused or spare T-Plugs should be placed out of the reach of young children to prevent chocking. 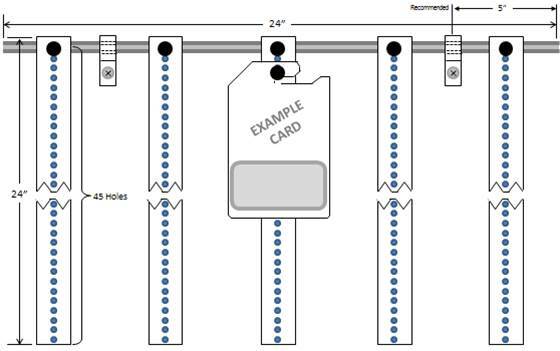 NOTE: The T-Plugs are designed to hold the D-Track on the U-Rail and to hold the collectible display cards or their protective covers securely on the D-Track. In some instances removal may require extra pressure to remove or ‘pry’ from the D-Track. Adult supervision may be necessary for younger children. Step one is to mount the U-Channel. Using the supplied screw and anchor sets, mount on the desired flat surface (wall). Screws can go directly into a stud/support or drywall anchor. U-Channel should be level on the flat surface (wall).